French President François Hollande said the deal would send a clear message to big polluters such as China and the United States ahead of UN talks in Paris next year to agree global legally binding greenhouse gas emissions. A special “flexibility clause” was added to the final text, making it possible for the European Council to return to the targets after the UN summit in December 2015. But Hollande told reporters that the clause was not dependent on the Paris talks, as the Council can revisit the targets anytime. Hollande, who will host the negotiations, said it was a “conclusive and definitive” agreement. It was essential a deal was reached before the Paris summit next year, he said. But the efficiency and renewables targets were watered down. The European Commission had called for an efficiency goal of 30%. That was reduced to 27% across the EU. The EU level target is not legally binding at the national level or EU level and will be reviewed in 2020 “having in mind” a 30% EU-level target, according to the summit conclusions. The renewables target of at least 27% is binding at EU-wide level but, after opposition from countries such as the United Kingdom, it will not be binding at national level. All three targets are compared to 1990 levels. German Chancellor Angela Merkel also noted that the climate agreement has made the EU capable of being an important player on the international stage. She said that the binding target of at least 27% renewables was particularly important to Germany and that those member states, that want to do more, are able to do so under this agreement. “Germany will not have a hard time [living up to the targets]. We have already set tougher national targets,” said the German chancellor. Merkel stressed that while the 40% emissions reduction target is going to be broken down to individual member states based on their GDP per capita, those countries that will have lower targets would have to do more in other areas. Free allowances of carbon emissions to poorer countries will continue after 2020 to offset competition from countries not subject to EU climate laws. The deal was condemned by groups such as Greenpeace and Oxfam as being too weak. “It is shocking that business leaders called for more ambitious targets than those agreed by EU leaders,” Oxfam said. Polish Prime Minister Ewa Kopacz said the deal would not cost her country. Poland was the country that mostly opposed ambitious climate goals, fearing for its coal power plants. “I said that we will not return from this summit with new [financial] burdens, and indeed there are no new burdens,” Kopacz told Polish reporters. Agreement was also reached on increasing the interconnectivity of Europe’s energy markets. Interconnectivity is an important part of the EU’s plans for Energy Union, which is partly intended to wean some member states off their dependence on Russian gas. Merkel said the EU is sending gas to Ukraine by reverse energy flows, but this would stop if it began to hurt the EU. Spain and Portugal were pushing for a binding obligation for member states to make 15% of their national generation capacity available to other EU nations. They have long argued that they have been prevented from selling their surplus renewable energy to France, which they accuse of protecting its nuclear industry. Instead, EU leaders renewed their 2002 commitment to increase energy trading through electricity connectors to 10% by 2020. Built into that is a commitment to subsequently up that percentage to 15%. The agreement specifically names so-called “energy islands” – Spain Portugal and the Baltic states. They should have the highest priority, according to the conclusions. Malta, Cyprus and Greece also needed special attention, EU leaders agreed. Regarding energy security in the context of the Ukraine crisis, EU leaders endorsed further actions to reduce the EU’s energy dependence and increase its energy security for both electricity and gas. Without going into detail, EU leaders agreed to implement critical projects of common interest in the gas sector, such as the North-South corridor, the Southern Gas Corridor, and the promotion of a new gas hub in Southern Europe. Also mentioned were key infrastructure projects enhancing Finland’s and the Baltic States’ energy security. These countries were singled out as the most vulnerable in the case of a complete disruption of Russian gas supplies. The Commission was also tasked to set up task forces on specific interconnectors with member states for the purpose of their speedy implementation. Member states are “encouraged” to provide ex-ante information in the field of their energy agreements with “third countries”, which basically means Russia. The European Commission will monitor progress on the issue and will report on financing possibilities. The Council invited the executive to make legislative proposals on funding, if appropriate. Asked if the deal represented a genuine chance of attitude from the French, Hollande said his country had always understood where Spain and Portugal were coming from. But it was also important to respect environmental law he said. France has argued the links across the Pyrenees could violate those laws. But advances in technological innovation in the coming years would minimise that, Hollande said. “New Commission president Juncker and his team have said they want to make Europe a leader in renewable energy. They now need to table watertight climate and energy legislation. Importantly, these new laws must stop giving dirty energy companies and polluting industries a free ride,” added Sideridou. Oxfam EU urged Europe to "review" its climate targets after what it described as a "weak climate package deal". “Today’s target of at least 40% of emissions reductions is welcome but only a first step, which falls far too short of what the EU needs to do to pull its weight in the fight against climate change," said Natalia Alonso, Oxfam’s Deputy Director for Advocacy and Campaigns. "Insufficient action like this from the world's richest countries places yet more burden on the poorest people most affected by climate change, but least responsible for causing this crisis." “By leaving the possibility to increase the 40% target as part of the international negotiations, European leaders such as Merkel and Cameron acknowledge that what has been proposed is inadequate – today's deal must set the floor not the ceiling of European action, and they must arrive in Paris with a more serious offer. It's shocking that business leaders called for more ambitious targets than those agreed by EU leaders today". Reducing emissions can be less costly in some places than in others, and this should be an opportunity, Van Rompuy said. He gave as an example that Denmark for instance which already has double-glazing everywhere – this country can decide, instead of going for triple-glazing, rather to help finance a double-glazing project elsewhere in Europe. That way, it can get more emissions-saving value for its money, he said. On the climate target of reducing at least 40% of greenhouse gas emissions by 2030, he said that this figure, which refers to the classic 1990 baseline, is binding. About half of the effort takes place within the EU-wide ETS; the other half takes place in the non-ETS sectors, with national, yet tradable targets. Van Rompuy called “ambitious” the clean energy target of 27% of renewables in 2030, as currently EU-wide, the share of renewables stands at about 14%, so 27% by 2030 means that by then Europe will double the share of clean energy. On the energy savings title, namely the increase of at least 27% in energy efficiency, he said that this figure was indicative and compares to 2030 projections based on current consumption and technology. It will be reviewed by 2020, having in mind an EU level of 30%. On the fourth target, namely energy linkage, he said that the objective is to have electricity interconnection worth 15% by 2030. This means that for each 100 megawatt it produces, a member state should have the infrastructure to be able to import or export 15 megawatt to neighbouring countries. “The new framework is an extremely challenging target for Europe’s industry in absence of similar constraints for our competitors worldwide. But the clear commitment by the heads of state to set safeguard measures at the level of the most efficient installations is a positive signal for industrial investment, growth and jobs in Europe”, says Axel Eggert, acting Director General of EUROFER. “Those installations above the benchmark will have to buy additional allowances on the market. This gives them the right incentive to improve their carbon efficiency to the level of the benchmarks. If they go beyond those benchmarks by developing and applying innovative, economically viable technologies, they may set new, more ambitious benchmarks”, Eggert says. “The adopted targets are far from ambitious and not only weaken Europe’s climate policy, but also undermine the fight for Europe’s energy independency. They are far from ambitious regarding making economic progress through a Green transformation, namely through enhanced efficiency and more renewables. 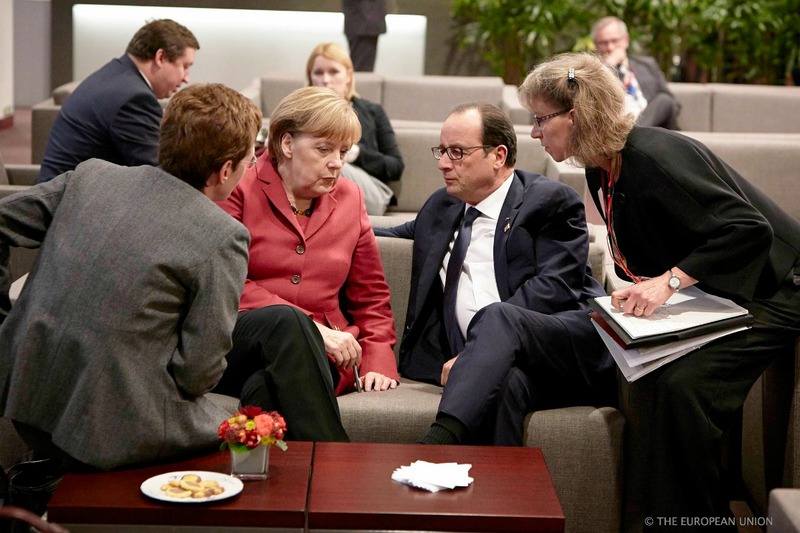 Europe's position for climate negotiations at the end of next year in Paris has been weakened. The reluctance to take more adequate steps will serve other players with an additional excuse to use – with these meager goals Europe has abdicated climate policy leadership. “It is shameful that the council gave veto power against better goals to Poland on renewables, to France on interconnectors, and to the UK on efficiency. […] We used to have a polluter-pays-principle; now we've gotten a polluter-vetos-principle. Brook Riley, climate justice and energy campaigner for Friends of the Earth Europe, commented: "To describe 40% emissions cuts as adequate or ambitious, as EU leaders are doing, is dangerously irresponsible. 40% is off the radar of climate science. This deal does nothing to end Europe's dependency on fossil fuels or to speed up our transition to a clean energy future. It's a deal that puts dirty industry interests ahead of citizens and the planet." "A 27% non-binding energy savings target means slowing down progress on energy efficiency at a time when Europe is facing energy insecurity and is considering dangerous and costly alternatives, like shale gas, tar sands and nuclear, to meet demand," continued Riley. Molly Walsh, climate justice and energy campaigner at Friends of the Earth Europe said: "The renewable energy target represents barely more than business-as-usual and will send a dangerous signal to national governments that EU renewables policy is being abandoned. The EU can achieve a much higher share for renewables by involving citizens in producing and controlling their own energy but this potential is being blocked by dirty energy corporations." The European Photovoltaic Industry Association also commented: "The renewables target is a very small step to support the enormous potential that solar and other renewables represent. It is still an important signal of political resolve to overcome the existing market barriers and the adverse national political contexts where some Member States have implemented retroactive measures for renewables," stated Frauke Thies, EPIA Policy Director. "The ball is now in the Court of the new European Commission to build on this minimum target with a meaningful legislative framework and fair market conditions for renewables. Technologies like solar must be able to realise their full competitive potential and keep Europe on track for the much-needed energy transition," concluded Thies. EURACTIV Turkey: AB liderleri, emisyonlar? 2030'a kadar yüzde 40 azaltmada anla?t?